Vladimir Petrovich Mamayev (1925-1987) is an outstanding chemist in the field of organic chemistry and organizer of science, corresponding member of AS USSR, director of the Novosibirsk institute of organic chemistry of SB AS USSR (NIOCh). Important achievements in the field of synthetic organic chemistry, chemistry of heterogeneous cycle compounds, as well as the formative stage and the development of chemical science in Siberia are associated with the name of V.P.Mamaev. He took the direct and most active part in the organization and in the formative stage of the NIOCh of SB AS USSR where he would work for longer than a quarter of a century, and where he was the director during the last eleven years. There, he developed extensive basic research in the field of chemistry of nitrous heterogeneous cycle compounds; new reactions have been discovered and new practically significant substances that are employed in medical and aniline-paints industry have been synthesized. He suggested and implemented new lines of attack to the synthesis of various pyrimidine compounds, a large number of previously unknown or hard-to-synthesize pyrimidines have been obtained. He investigated processes of nucleophilic substitution in a series of pyrimidine halides, tautomeric transformations of substituted azines, transmission of electronic and spatial effects over a pyrimidine nucleus and over azines as substituents. 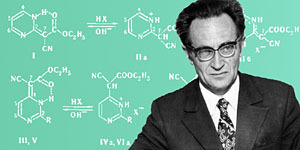 V.P.Mamaev's paid great attention to the biological activity of azines and to their applications in various fields of the national economy; however, he also performed a series of basic works in the field of indole chemistry. Vladimir Petrovich has published approximately 300 scientific works, he was the author of a variety of certificates of authorship and patents. He was a supervisor of 15 candidate and 2 doctor's dissertations. V.P.Mamaev conducted a great pedagogical work in Novosibirsk state university. He constantly combined fruitful scientific and pedagogical work with that of scientific-and-organizational kind and public kind. He was a member of the Presidium of the Siberian Branch of AS USSR, the vice-president of the Unified Academic Council on chemical sciences, a member of specialized councils and editorial boards in scientific magazines. As he was the co-chairman of two coordination councils on joint research of the Siberian Branch of AS USSR with the Ministry of Biomedical Industry and the Siberian branch of Academy of Medical Sciences, V.P.Mamaev has made a great contribution to the development of cooperation and to the promotion of scientific investigations of the Siberian branch to medical science and practice. V.P.Mamaev repeatedly and adequately represented the Soviet science in many international congresses and symposiums in chemistry of heterogeneous cycle compounds, he was the initiator and the organizer of several heterocyclic congresses in the Soviet Union. For his great scientific, scientific-and-organizational and public work, V.P.Mamaev has been awarded with two orders of the Labour Red Banner, with the Order of People Friendship, and with medals. * Sources: 1) YAkhontov L.N. Vladimir Pyetrovich Mamayev / L.N.YAkhontov, N.N.Suvorov // KHimiya gyetyerotsiklichyeskikh soyedinyenii. - 1987. - N 4. - S.568-569. 2) Vladimir Pyetrovich Mamayev v vospominaniyakh / Sibirskoye otd-niye. ros. Akad. nauk, Novosibirskii in-t organichyeskoi khimii im. N.N.Vorozhtsova; Otv. za vyp. O.P.SHkurko. - Novosibirsk, 2005. - 85 s.
Dokumyent izmyenyen: Wed Feb 27 14:46:38 2019. Razmyer: 9,636 bytes.